Before settling down to have chicks of its own, a young adult loon shops around. It visits different lakes, swimming in them to test the water. Finally it chooses a home. Rather than selecting the best neighborhood in which to raise its young, though, the loon seems to pick a place that feels comfortably like where it grew up. If it's not the best place to raise kids, too bad. Walter Piper, a biologist at Chapman University in California, has been chasing loons in Wisconsin for more than two decades. "It might seem like self-flagellation," he admits. Loons are a difficult study species, in that they tend to dive straight down into the water when a human approaches. Piper and his colleagues followed the aquatic birds between 1991 and 2012, snagging them with fishing nets and banding their young, and were able to build a detailed, multi-generation history of bird real estate decisions. 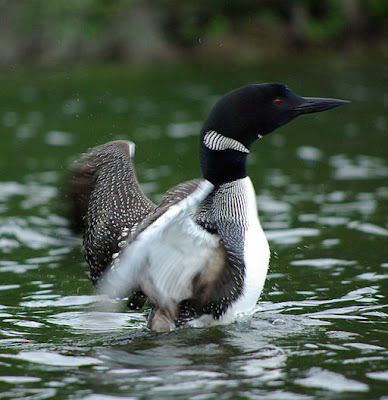 Common loons (Gavia immer) grow up in nests on the water tended by two parents. When they reach adulthood, they migrate over the winter and then return to make their own homes for breeding. The study area in Wisconsin is dotted with small glacial lakes, and breeding pairs of loons often claim an entire one of these lakes as their own territory. When it comes time to choose an adult home, young loons that are thinking of the children ought to choose large lakes with a high pH; these have been shown to produce larger numbers of healthier chicks. Yet the adults don't always pick those prime locations. The researchers tracked the movements of their loon subjects, as well as various qualities of the lakes they moved between: shape, depth, clarity of the water, and so on. They also ran computer simulations to see where loons might end up if they chose their new habitats randomly. Instead, they found that loons tended to choose lakes that were similar to where they grew up, both in the pH of the water and in overall size. How do house-hunting loons find lakes with the qualities they care about? Piper says loons are adept at judging the size of a lake from the air, since they're big birds that need a lot of "runway" to take off from. If they land in a too-small body of water, they'll get trapped there. As for pH, he acknowledges, "We do not see loons using pH meters or pH paper." But the types of fish, insects and so on that live in a lake correlate to its acidity or alkalinity. This mix of prey species is probably one thing loons are judging when they shop around for a home. Piper thinks loons must benefit from choosing lakes that are more like where they were raised, even if these aren't the lakes that produce the most chicks right away. Perhaps by choosing someplace similar to their old hunting grounds, they make it easier to find food. This might allow the loons to survive for more years, ultimately making up for their original disadvantage in number of chicks. "Our finding shows that animals sometimes DO NOT pick the habitat that promises greatest reproductive success," Piper says. He thinks other scientists studying how animals choose homes should focus more on parents, rather than their offspring. And when loon chicks complain about their habitat, their parents can tell them, "Back in my day we lived on a tiny lake and we liked it! There were even these people chasing us around with fishing nets..."
Thank you for this post, including the picture! The loons are beautiful and a symbol of wilderness to me. I wish there were some on the Wisconsin lake my parents live near, but there are too many houses and boats for these splendid birds to be comfortable.